When we asked Korina Emmerich what her go-to piece of advice would be for fellow emerging designers she confidently replied, "Work fast and stop thinking so much. You’ll be surprised how fast you define your brand when you just keep your head down and work." After visiting Korina earlier this month at her Brooklyn studio we quickly learned that the designer's wisdom has translated into the success of her own namesake brand Emmerich NY. With a detailed design process, bold colors and textured fabrics, the contemporary brand caters to those who value art's role within the fashion industry. Our designer community in general has proven that there is incredible value when it comes to embracing the art of fashion and weaving it into their brand story. 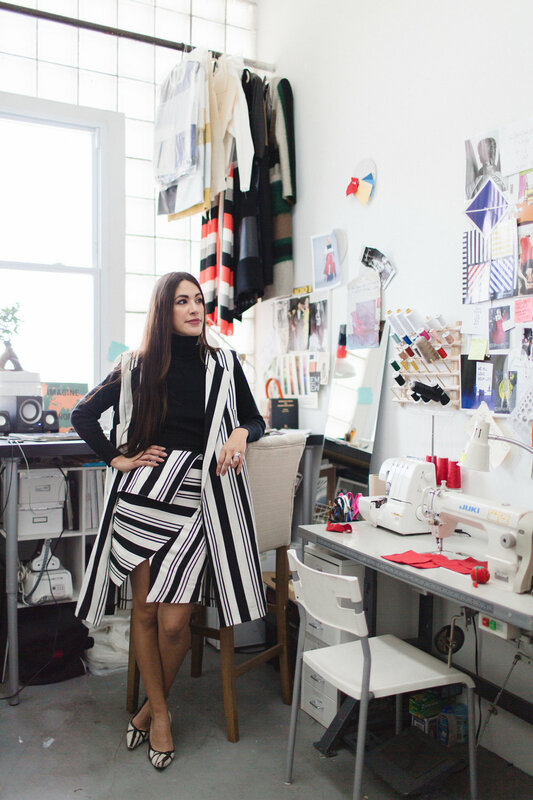 Korina is one of the designers leading the charge in this and we were excited to chat more with her about this important element in her brand. During our visit together Korina also shared more on what she hopes to provide the contemporary shopper and what she's assembling this holiday season. Learn more in our chat with her below and also visit The Style Line for a second part of this interview. Hi there, I’m Korina Emmerich. Currently I am a research junkie and an avid art nerd. I’ve lived in NY for 8 years now and am lucky to have seen artwork from around the world, that as a young girl growing up in Oregon, I didn’t think I’d ever see in person. I remember the first time I saw Andy Warhol’s soup cans in the MoMa and my eyes uncontrollably filled with tears after acknowledging the fact that all the cans had minor shifts in their shades of red because they were all printed at different times, and it’s almost impossible to mix the same shade over and over. I cried because that’s something that could never be translated through a photograph... I’m also a huge color nerd... clearly. My passion lies in art and music. I grew up playing piano, clarinet, and taking ballet lessons. My father was an art teacher. Funny enough because I always used to refuse to take art classes insisting, “No one will ever tell me how to draw" little did I know I was given an art lesson just about every day of my life. My favorite studies were in color theory - which has definitely shaped who I am today as a designer. Who is the Emmerich woman and what do you hope the Emmerich brand contributes to her wardrobe? The Emmerich woman is confident, driven and artistic. She’s not afraid to stand out in a crowd. She’s the type of woman who wears a leather jacket to a board meeting or a full matching ensemble to the grocery store. She’s unapologetically fashion forward. The Emmerich brand fits easily into her wardrobe because the cuts are wearable, familiar and comfortable but stand out just enough. She’s not afraid of color, she’s not the type to go for the Little Black Dress. She exudes confidence through her style. I was approached by Brand Assembly post Project Runway and post MBFW. They were in the audience and loved the collection, the color story and the cuts. I remember our first meeting when they sat me down and said, “So, do you want to be a fashion designer?” From that moment on they did everything in their power to literally assemble my brand. I designed and produced a full collection for Brand Assembly at Lord & Taylor. It was a dream come true seeing the garments on the racks. I think I teared up the first time I saw the care labels with my name on it. It sounds silly but I think that’s the moment it all hit me. The community of designers I’ve met through this has been incomparable. It’s such a supportive group of young designers and thrilling to see everyone’s growth. From Hunter Bell to Nikki Chasin I love following everyone through social media and quietly cheering them on. 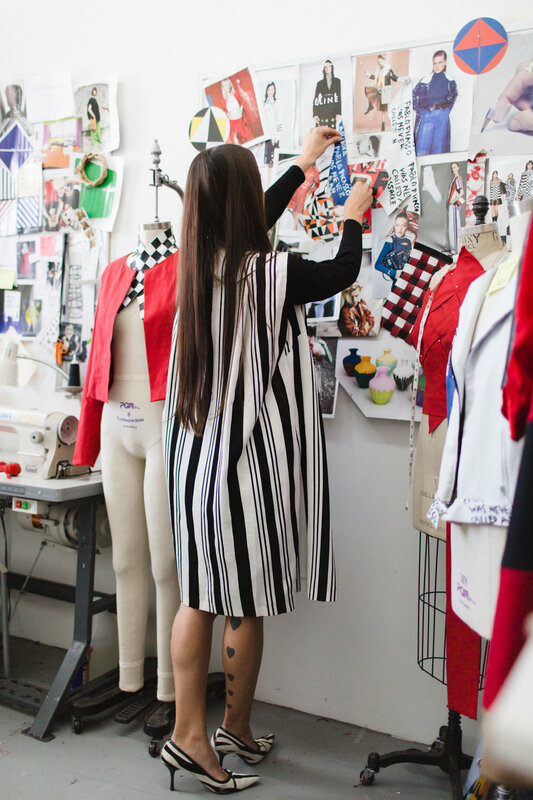 From Project Runway to debuting at MBFW what advice would you offer to fellow designers who are looking to take the leap of faith in advancing their brand? Work fast and stop thinking so much. You’ll be surprised how fast you define your brand when you just keep your head down and work. Also, MAKE A BUSINESS PLAN. It’s not fun at all, but it will save you a lot of headaches and force you to really define your goals. With the holiday season just around the corner what are a few core pieces you would recommend as gifts for the Emmerich woman? I always say the Emmerich woman invests in jackets and coats not gowns. Three core pieces for the holiday season are definitely: A killer leather jacket, a luxurious wool coat and an everyday cap. Mix and match to your own taste!